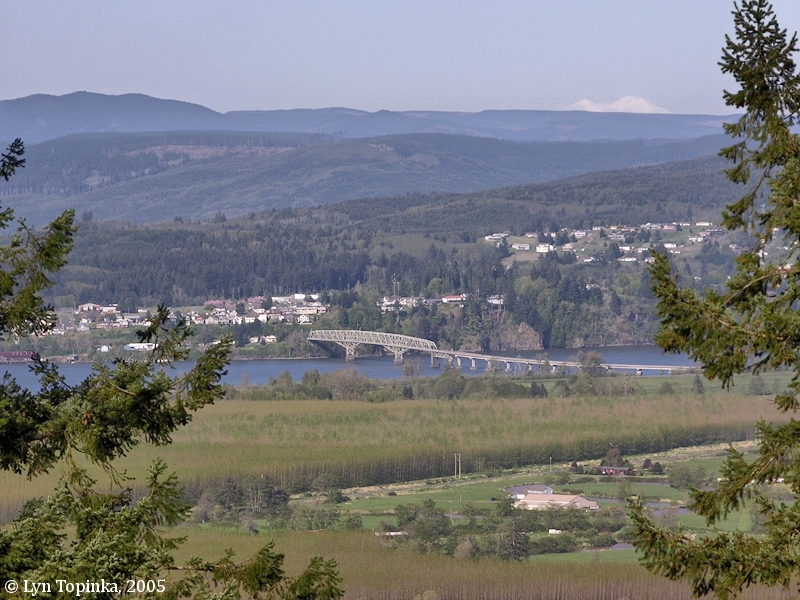 Click image to enlarge Mount Rainier and Longview, Washington, as seen from Rainier, Oregon. Image taken February 11, 2004. Mount Rainier, at 14,410 feet in elevation, covers 235,625 acres, and is the highest peak in the Cascade Range. It is third in volume, after Mount Shasta in California, and another Washington State volcano, Mount Adams. Mount Rainier is host to twenty-five separate, named glaciers, the largest single-peak glacier system in the United States outside of Alaska. Measurements of the movement of the Nisqually Glacier date from 1857. Geologists date Mount Rainier as approximately one million years old, with its last known eruption between 1820 and 1854. Click image to enlarge Mount Rainier and Vancouver Lake, Washington. Image taken February 11, 2004. 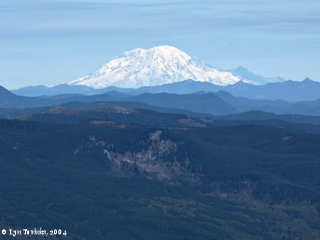 Click image to enlarge Mount Rainier from Larch Mountain, Oregon. Image taken October 11, 2004. Peter Rainier was born in 1741 and entered the Royal Navy in 1756 at age 15. He rose through the British Navy ranks until his retirement in 1804. In 1805 he was advanced to the rank of Admiral, became a member of Parliament in 1807, and died in 1808. In October 1792 Lieutenant Broughton of the Vancouver Expedition entered and explored the first 100 miles of the Columbia River. Indian names for Mount Rainier have been numerous, including "Takhoma", "Tahoma", "Ta-co-bet", "Ta-co-be", "Tu-ah-ku", and "Puak-coke". Many of the names used translated to mean "big mountain" or "snowy peak" or "place where the waters begin". 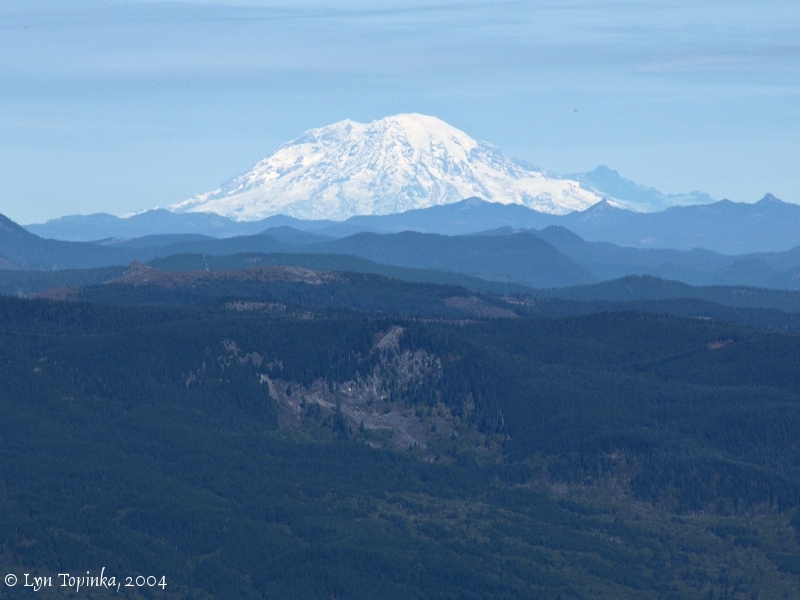 For many years the peak was locally called "Mount Tacoma" or "Mount Tahoma" and claimed as "theirs" by the city of Tacoma. The U.S. Board of Geographic Names made "Mount Rainier" the official name in 1890 (note: 1890 date came from the GNIS database, Hitchman in Place Names of Washington says 1917). 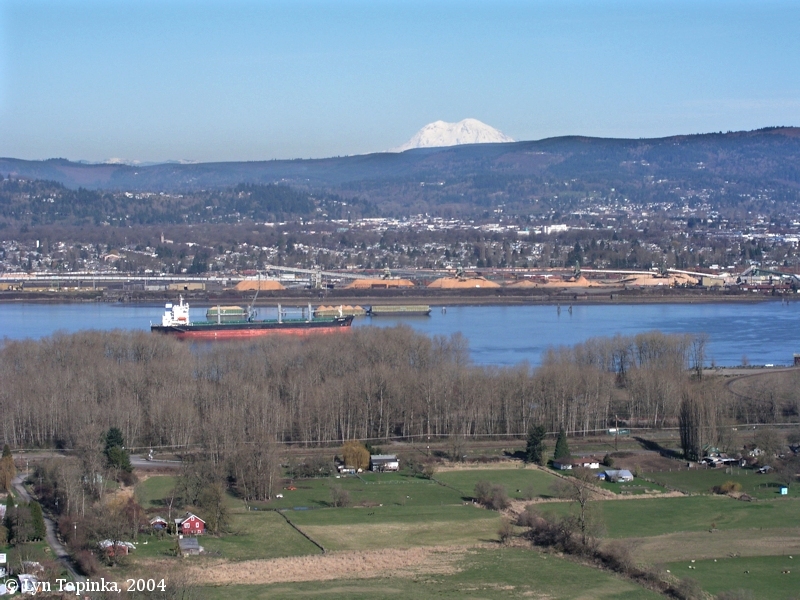 The Mount Tacoma/Rainier name debate continues. Mount Rainier National Park was established as the nations fifth National Park on May 2, 1899, after Yellowstone (established in 1872), Yosemite, General Grant (now part of Kings Canyon), and Sequoia (all established in 1890). In 1997 a part of the park was designated a National Historic Landmark District as an example of early park planning and National Park Service rustic architecture. One-hundred and twenty-eight buildings within the Park are on the National Register of Historic Places, and five buildings are National Historic Landmark Buildings. In 1839 Hall J. Kelley tried unsuccessfully to change the name to "Mount William Henry Harrison" as part of a scheme to rename the Cascades to the "Presidential Range". The first attempt to scale the peak was in 1857 by Lieutenant (later General) A.V. Kautz, of the American Army. Kautz climbed along the edge of a glacier (now the Kautz Glacier) and failed to reach the summit by only a few feet. The first successful climb of the peak was in August 1870, when explorers Hazard Stevens and P.B. Van Trump reached the summit. "... Wherever we came in contact with the rocks of these mountains, we found them volcanic, which is probably the character of the range; and at the time, two of the great snowy cones, Mount Regnier and St. Helens, were in action. On the 23d of the proceding November, St. Helens had scattered its ashes, like a light fall of snow, over the Dalles of the Columbia, 50 miles distant. A specimen of these ashes was given to me by Mr. Brewer, one of the clergymen at the Dalles. [Fremont, November 13, 1843] ..."
"St. Helens" is Mount St. Helens and "the Dalles of the Columbia" is today an Oregon city called The Dalles. "... 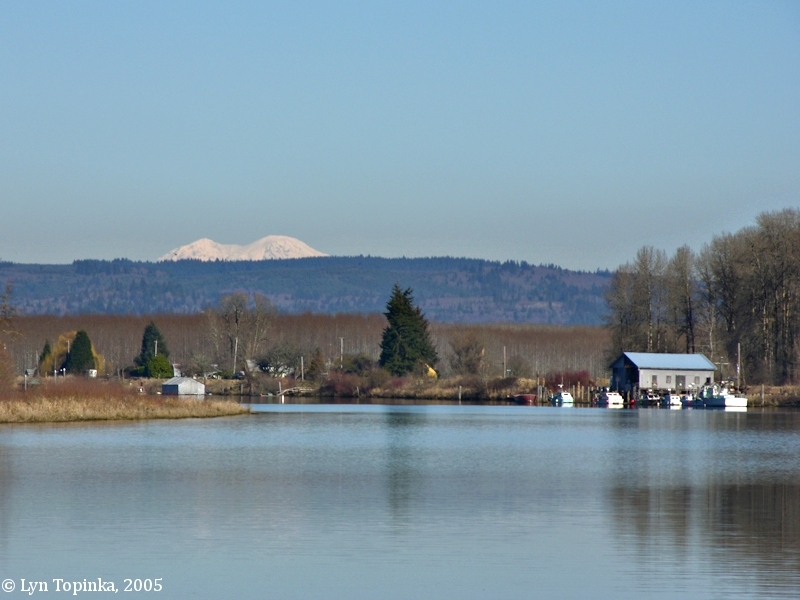 When off the entrance [of the Columbia River] in fine, clear weather, the beautiful snow peak of Mount St. Helens shows over the lowest part of the land inside, and apparently in the middle of the river valley. It is very regular in outline, and presents a pyramidal appearance, having a base equal to either side. It is over 75 miles eastward from the entrance to the river, and attains an estimated elevation of 13,500 feet. It is volcanic, and occasionally discharges volumes of smoke. On the 23d of November, 1842, during an eruption, the ashes from it fell over the Dalles of the Columbia like a light fall of snow. 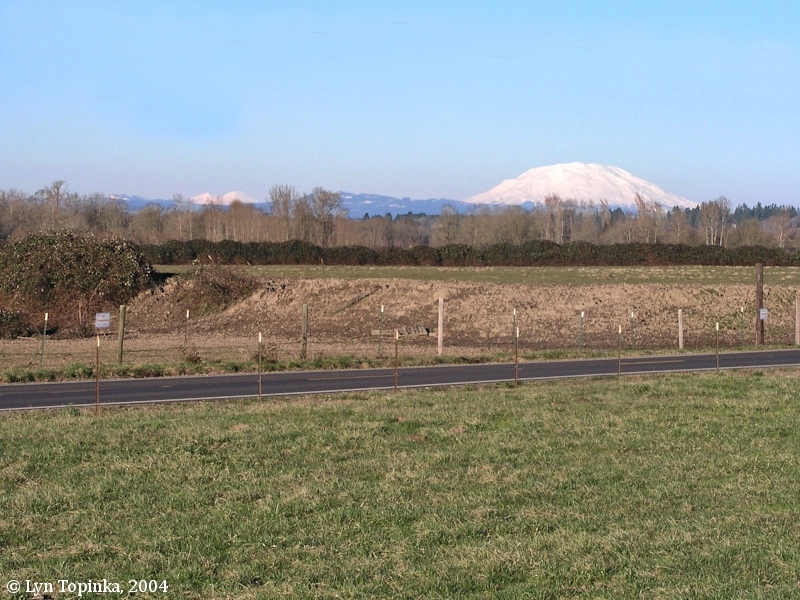 On the 13th of November, 1843, St. Helens and Rainier were both in action. Humboldt erroneously states that this volcano is always smoking from the summit crater. ..."
Click image to enlarge Mount Rainier, Washington, as seen from Blurock Landing, Washington. Blurock Landing lies across the river from the mouth of the Willamette River. Image taken March 19, 2010. Photo by Lyn Topinka, October 11, 2004. The flank of Mount St. Helens is just visible on the right. Mount Rainier, Washington, with the city of Longview, Washington. 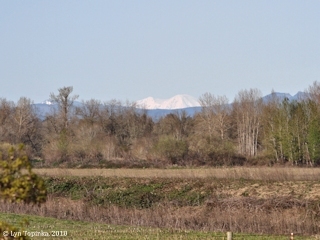 Image taken from Oregon Highway-30, just downstream of Rainier, Oregon.